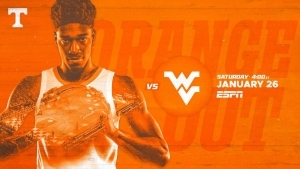 KNOXVILLE, Tenn. — Top-ranked Tennessee and West Virginia are set to meet on the hardwood Saturday at Thompson-Boling Arena in front of a sold-out crowd as part of ESPN’s SEC/Big 12 Challenge. The game will tip at 4 p.m. ET and will be televised on ESPN and can also be viewed online through WatchESPN. Fans can listen live on their local Vol Network affiliate to hear Bob Kesling and Bert Bertelkamp describing the action. In its sixth year, Tennessee (17-1) holds a 3-1 record when competing in the cross-conference showcase, including a 68-45 win at Iowa State last season. The Vols and Mountaineers (9-10) are meeting for the first time since Nov. 23, 2007, when seventh-ranked UT defeated West Virginia, 74-72, at the Legends Classic in Newark, New Jersey. The Big Orange enters the game after a dominant performance by Grant Williams on Wednesday night to lift the Vols over in-state rival Vanderbilt on the road. The junior forward finished with a career-high 43 points. It was the most points scored in a game by a Vol since all-time leading scorer Allan Houston also dropped 43 against LSU on Feb. 10, 1990. Williams’ effort also tied for the fifth-most points in a single game in school history. Williams was 10-of-15 from the field and a program-record 23-of-23 from the free-throw line. That mark broke the Tennessee records for most free throws in a game and consecutive free throws in a single game, surpassing Bill Justus’ 22 total makes and 18 consecutive free throw makes vs. Ohio on March 17, 1969. West Virginia lost its best player, junior forward Sagaba Konate (13.6 ppg, 8.0 rpg, 2.8 bpg), to injury in December. However, junior guard James Bolden and senior forward Esa Ahmad have stepped up in his absence. Bolden leads the team in scoring (12.8 ppg), assists (2.6 apg) and steals (1.1 spg). He is second on the team in 3-pointers with 29 makes on the year. Ahmad is an all-around player, leading the team in rebounding (5.6 rpg) and ranking second in scoring (12.3 ppg), assists (1.8 apg), steals (0.9 spg) and blocks (0.7 bpg). The anticipation by the fans for this exciting season was felt early on when the West Virginia and Kentucky games sold out shortly after single-game tickets went on sale. Now, all Saturday home games are sold out and limited tickets are left for the remainder of Tennessee’s home slate. Visit AllVols.com soon if you’re interested in buying tickets for one of our remaining conference games. • Tennessee trails the all-time series with West Virginia, 3-5, dating to 1958. This is the 196th meeting. • The Mountaineers have a 2-1 edge when the series is played in Knoxville. • Tennessee is 13-18 all-time against current members of the Big 12 Conference. • Extend Tennessee’s win streak to 14 games. That would be UT’s longest win streak since the 1922-23 campaign, when the Vols opened the season with 14 straight victories from Jan. 8 through Feb. 20. • Stretch the Vols’ home win streak to 20 games, dating to last season (this is the longest home win streak of the Barnes era). • Give UT an 11-game win streak in regular-season SEC games. • Give Tennessee a 4-1 record in the SEC/Big 12 Challenge. • Tennessee is aiming for its third straight win in the annual SEC/Big 12 Challenge. • This is Tennessee’s best start to SEC play since it won its first eight league games in 1981-82. • The Volunteers received 48 of 64 first-place votes in this week’s AP Top 25 poll. This is the second week in history that Tennessee has been ranked No. 1. • Wednesday at Vanderbilt, Grant Williams’ 23-of-23 effort at the free-throw line marked the most makes without a miss in a Division I game since Oklahoma State’s Arlen Clark went 24-for-24 60 years ago on March 7, 1959. • This is Rick Barnes‘ longest win streak since he led Texas to a 17-0 start to open the 2009-10 season. • The Vols have shot 50 percent or better in 13 games this season (and 10 of their last 13). • Tennessee has yet to face a double-digit deficit this season. • Grant Williams leads the SEC in scoring (20.3 ppg), ranks second in field-goal percentage (.569), ninth in assists (3.6 apg) and eighth in rebounding (7.5 rpg). • Admiral Schofield is the SEC’s fifth-leading scorer (16.7 ppg), and is shooting .420 from 3-point range. • Williams and Schofield both earned a spot on the 25-man Wooden Award Midseason Watch List. • Point guard Jordan Bone owns the sixth-best assist/turnover ratio (3.83) in Division I and ranks 17th in the country in assists per game (6.4 apg). • Kyle Alexander is the SEC’s third-leading rebounder during conference play, as he averages 9.2 rebounds per game. • During league play, SEC Sixth Man of the Year candidate Jordan Bowden ranks second on the team and eighth in the SEC with 16.3 points per game. • Tennessee is competing in the SEC/Big 12 Challenge for the fifth time, hosting West Virginia on Saturday, Jan. 26, to cap off its 2018-19 regular-season non-conference slate. • All-time, the Vols are 3-5 against West Virginia, including a 1-2 mark in Knoxville. The programs haven’t met since Nov. 23, 2007, when the seventh-ranked Vols defeated the Mountaineers, 74-72, at the Legends Classic in Newark, New Jersey. • The matchup between the Vols and Mountaineers (9-10, 1-6 Big 12) pits two of the top active coaches in Division I in terms of career victories. West Virginia head coach Bob Huggins ranks fourth with 782 wins, while Rick Barnes ranks seventh with 678 triumphs during his career. • West Virginia lost its best player, junior forward Sagaba Konate (13.6 ppg, 8.0 rpg, 2.8 bpg), to injury in December. However, junior guard James Bolden and senior forward Esa Ahmad have stepped up in his absence. • Bolden leads the team in scoring (12.8 ppg), assists (2.6 apg) and steals (1.1 spg). He is second on the team in 3-pointers with 29 makes on the year. • Ahmad is an all-around player, leading the team in rebounding (5.6 rpg) and ranking second in scoring (12.3 ppg), assists (1.8 apg), steals (0.9 spg) and blocks (0.7 bpg). • Derek Culver (10.9 ppg, 8.3 rpg) missed the first part of the season before returning to the hardwood in December. The freshman forward also has helped to fill the missing role of Konate in the post while shooting at a 53-percent clip from the floor. • Tennessee survived several West Virginia attacks in a 74-72 semifinal win on Nov. 23, 2007, at the Legends Classic in Newark, New Jersey. • The Vols took a 7-6 lead with just over 15 minutes left in the first half and maintained a lead that grew to as many as seven points before taking a 33-28 advantage at the half. • UT held the lead until the Mountaineers went on a 9-0 run to take a 41-39 advantage with 14:48 left. • A three-point play by Ramar Smith and a pair of 3-pointers from JaJuan Smith keyed a 9-2 run that gave the Vols a 48-44 lead. Tennessee never trailed again but had to withstand several late pushes by WVU. • Alex Ruoff’s 3-pointer with 15 seconds left cut UT’s lead to 71-70 but JaJuan Smith sealed the win with three free throws in the final 13 seconds. • Chris Lofton led the Vols with 19 points. JaJuan Smith added 17 points despite being saddled with foul trouble for much of the second half. Wayne Chism led the Vols with seven rebounds while adding 15 points. • Tennessee had 10 steals off 19 West Virginia turnovers. • The Big SEC/Big 12 Challenge is in its sixth year. Tennessee is 3-1 in the event, as the Vols did not take part in the inaugural challenge. • Through five years, the SEC trails the challenge, 21-29. • Last season, UT posted a convincing 68-45 road win at State (1/28/17). • Tennessee’s all-time record against current members of the Big 12 stands at 13-18. Fourth-year UT head coach Rick Barnes—who spent 17 seasons coaching in the Big 12 before transitioning to Knoxville prior to the 2015-16 campaign—owns a 159-95 record against current Big 12 teams and is 8-4 in his career against West Virginia. • This year’s Suits and Sneakers Awareness Week runs Jan. 21-27. Tennessee’s staff is wearing sneakers for UT’s games against Vanderbilt (W) and West Virginia. • Tennessee owns a 15-5 record in Coaches vs. Cancer “Suits and Sneakers” games, dating to the NABC/American Cancer Society initiative’s launch in February 2004. • The Vols are 9-2 at home and 6-3 on the road when the coaching staff breaks out its fresh kicks. • The Coaches vs. Cancer mission is to increase cancer awareness and promote healthy living among students, faculty, school staff, fans and the community at large, through year-round awareness efforts, fundraising activities, and advocacy programs. • Tennessee’s 6-0 start to SEC play is its best start in league play since it won its first eight conference games in 1981-82. • Head coach Don DeVoe guided Dale Ellis and the Vols to a 13-5 league mark to tie for the SEC Championship that season. Tennessee finished 20-10 overall after falling to a Ralph Sampson-led Virginia squad in the NCAA Tournament. • Grant Williams enjoyed a record-setting night at the free-throw line on Jan. 23 to lead the Vols to an overtime road win at Vanderbilt’s Memorial Gym. • Williams was a perfect 23-of-23 at the line, setting an SEC record for most free-throw makes without a miss in a single game. • It was the second-most makes ever in a single game by an SEC player and the third-most makes ever in an SEC intraconference game. • It also was the most makes without a mess in a single game by a Division I player in 60 years (since Oklahoma State’s Arlen Clark went 24-of-24 on March 7, 1959. • Williams drew an incredible 14 fouls in the win, and he attempted and made more free throws than Vanderbilt’s entire team (13 of 21).